Appearance: Kenji appears as a man apparently ranging from 20-26 years of age (Human terms). Kenji's hair is colored of a grey shade, and it is a somewhat spiky or rosy hair but the bangs still drop down to cover his right eye. His hair is pretty much long. He has red eyes, which always have a lonely expression. He has a fair skin color. 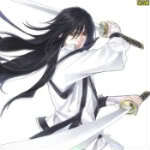 His zanpakuto is dangling from his belt, which he attached using a strong rope. His captain's haori is worn just as others do, only that it is fashioned like a cape, much shorter than the normal haori, having only a length that shows the insignia sand above. Personality: Kenji is the cold and serious type of guy. He isn't about being comical or humorous at all, though he still treats obvious jokes as something you shrug off your shoulders. Most of the time, he doesn't show regards of the emotions of those he confronts, but he occasionally displays his own set of emotions. Although, he almost always doesn't let these "useless emotions" to get in his way. This in turn, makes him a merciless opponent capable of killing without remorse. He is also, a rude person; He instinctively makes rash comments in trying to destroy the dignity or pride of a person, and on rare cases as an enlightenment--like proving someone wrong. Still, he respects those who are powerful and confident, as such, when faced with that kind of opponent, tries not to misjudge. Also,he is the type of person that uses tactics and strategies in a fight. He has a great understanding of things because of his hidden nature of trying to find out how they work, or how they turned out like that. Still, some of these things he learns about are deemed insignificant or useless to him by his own accord. He follows by his own set of philosophies and beliefs regarding to them as 'his principles', and regards the principles of others as stupid or incomplete. He likes talking about his own understanding of things, and sometimes of the others, while most likely trying to find a way to wrong the reasons of those people. He always fights for these beliefs, or with these beliefs in mind. 1. Treat life as a challenge, and everyone you do not know as an enemy. Kenji will never take life for granted. As such, he values it's challenges greatly, as it is the one that shapes life. Also, he will not trust anyone, even if that person was the only person in the world who is trustworthy. 2. I will never know everything, not even most of life, but I will try to. Kenji acknowledges himself that life is not an open book. It is something that you must examine for enlightenment and for you to know the things you must. It is something that will only present you opportunity, but never a straightforward reward. 3. Do not die with honor, but live with dignity and pride. Kenji is not one of those honorable beings that will fight and die as a hero. He will by all means, try to survive any battle, take all chances to win and survive with his head held high. Amongst other things, Kenji loves playing musical instrument, especially the guitar. It gives him a sense of harmony in life and also requires him to understand the concept of the instrument himself, much to his amusement. A thing about Kenji is that when he cannot actually understand how things are happening or even the powers of his enemies, he gets frustrated and starts doing plans and ideas that are not worth the effort and could only get him in trouble. Kenji died when he was 23, back when he was still human. He died of leukemia at such a young age, and was sent to soul society by an unknown shinigami. Kenji resided on the same district Zaraki Kenpachi first resided, District #80-- Also known as Zaraki. It was a lawless and disoriented place to live in, and Kenji was not one of the lucky ones who resided on a more peaceful area. He was particularly quiet while he was here. Although many dangers wait along the corners, he was pretty much at ease. He had killed many before him, those who tried to topple over his way. He lived everyday as if it was the greatest challenge of his life, being placed in life-or-death situations regularly. Not a day goes on without bloodshed, from him or from his enemies. He has learned to try and survive the harsh environment, and day by day learns a lesson for him to keepfor the rest of his life. It was also during this time, that he came to be the person he is at present. His enemies despised him. He would always taunt them, as a form of bait or just a form of insult-- One way or another; they always would go after him. The people had no control over their lust of power and their instinct to kill; hence it was the same for Kenji at the beginning. He taunts to kill, to lure the enemy near his grasps. He was cold, and merciless. He didn't care if the enemy was crying before him asking for mercy, he would always deal the killing blow. Many had taken him for granted during this time, as most would have to anyone living around the area. But this man was smart; he didn't become prey to anyone, atleast barely. Everyday he tried to understand what it meant to live, and what the things around him meant to life. He was curious about everything giving him all the more reason to fight. His willingness to learn and understand improved his battle senses, as well. It was not until one day that this end lesscycle of death ended. his death. Just as Kenji was about to give the finishing blow, the stranger lift his as if he was trying to plead. "I have lived and killed many, but not because I wanted to. It was because there was no other choice. Everywhere I go, they would try to stab me. Everywhere I look, a sword is pointed at me. I had no chance of running or hiding. I had to fight. You we're one of them, those who kill without any good reason. I despise you, I hate you." "I have a reason. My reason for fighting is to learn and live as well. Don't think pleading would work, young man." "I am not pleading for your mercy. I am merely surrendering myself. Deep inside, I am happy that the challenges are near its end. Though, I will never be able to enjoy the pleasures of life anymore." "Pleasure. There's no such thing. The world is as harsh as it can be, and we all are. I bet you are not stupid to say such things, but you do have your own mind. All I can say is that, you're way of thinking is below that of the facts of the world." "You do not know that. You haven't even stepped out of this district. The world outside this place is much more peaceful and joyful. I wanted to go out to that kind of place, but you prevented me from doing it." Kenji did not let his emotions get the better of him. He resolved to kill the man. Without a reply, he lifted his sword and slashed the man's body. The man lay dead on the ground. It was only then, that Kenji felt his heart beat. He was breathing heavily, and his eyes we're not showing any signs of killer intent. He acted on impulse. He thought he was thinking, but he realized at this very moment that he was wasting his life on understanding without having a true purpose. He realized that this man, wanted deeply to enjoy the opportunities of life, but Kenji had stopped him from doing so. He has wasted life after another, without actually learning about life- So why is he continuing like this? He was very confused. He stared at the man. He wasn't guilty of killing him; he was guilty of wasting his own life and in turn trashes those of the others. He needed a change of path. He realized that his way of educating himself about life was wrong. That life wasn't all fighting; but it was still a challenge. He needed to learn with a purpose. "I shall review on your words, young man. But for now, thank you." He had now a new resolve. Not to waste his own life on these meaningless battles. If he was going to kill, it would be because he needed to. If he was going to deprive, it was because he must. It didn't mean that he was going to stop fighting; it only meant that he was changing roads. He had a new purpose now, and this time, it was not fighting to learn; but living to understand. With his mind finally made up, he decided to go to Sereitei and apply as a student on the Shinigami Academy. A huge milestone for the new shinigami; Kenjiwas accepted as a new student in the Shinigami Academy. He didn't have to cope up with this new environment. He easily adapted to it. All the things he knew from back then are all giving their benefits to him. He is now starting a new life. sword, and great hand-to-hand combat prowess, but it wasn't that of a genius level. Still, it was really a sight for the instructors at the academy. They also noticed his separation from society and as such even they rarely talk casually with him. His second and third years at the academy we're all about him trying to improve his own style of fighting. He fought with his zanpakuto's blade pointed towards his body,with the pinky acting as somekind of pivot along with the thumb. His kidou was average though. He disliked using kidou, and thought it would be useless. As such, he ignored trying to improve his kidou abilities. During his fourth year, his class was sent to Earth for some kind of a fieldtrip. Gotei 13 Shinigami accompanied them to Earth, and went on an occasional hunt for hollows. The students we're not allowed to battle them, but they watched from a distance as the shinigamis exterminated them. There was a time that Kenji grew impatient of him only watching the battle, and not actually improving him. While the class and the shinigami was busy on a hollow, Kenji split up from the group to try and find hollows himself. His search did not go without a reply, as a hollow appeared from behind him. Kenji reached for his sword, and jumped. He pointed his sword at the hollow, in an attempt to plunge its mask. This was futile. Not only did the blade not penetrate, but Kenji was repelled backwards. He was shocked, and tried to right himself mid-air. As he did so, the hollow raised a hand and then swung his arm across, hitting Kenji. The hollow was large, as tall as a small house. Its body was more complex than other hollows, somewhat humanoid with bull-like features on his body. This was not a normal hollow. It was far more powerful than the other shinigami fought. It was an adjuchas. He did not realize it at once though, that's why he thought he could finish the battle in one blow. He only found that out when the hollow spoke, giving Kenji the idea that this hollow was aware. The hollow neared Kenji. He tried to move out of the way as the hollow kicked his sides. He couldn't dodge it and he succumbed to the power of the kick. There was no way he could win. He hasn't heard of this kind of hollow before, and it was his first time seeing it. He was struck with fear for the first time, and wanted to runthe hell away for his life. The hollow raised his hand again, this time pointing to the lying Kenji. The hollow's hand generated a bright-red light, in a shape of a ball. It was cero. He didn't understand why he was losing. Why this hollow was so strong. And even how powerful the cero he was going to fire. He was lost on his thoughts. He thought he was going to die. Until the cero suddenly dissipated. His eyes saw relief, as the hollow dropped to the ground all of a sudden. He was still confused. He didn't know what happened. He saw his classmates behind a group of shinigami, all with worried looks on their faces. He was awe struck by what had happened. Shinigami medics approached him and then healed him. He contemplated about what happened; he was not strong enough. There was a problem with a barrier that didn't allow those who had powerful reiatsu to enter, that's why he encountered such a powerful hollow instead of those normal hollows. He was foolish. He did not know about these hollow beings completely, yet he thought that he could take them fool on. With this realization, he went home knowing that everything about life is vague and unclear. He spent his fifth year improving his mind. He has reached a level of physicality with which will be useless with a weak thought. So he meditated at least twice a day, and studied about philosophy and history. He was determined to become stronger. Halfway through the fifth year saw Kenji's big break. The Gotei 13 has noticed his analytical skills and his curiosity, and decided to put it to big use. His first mission was not to be involved onactual battle, to avoid it as much as possible. Rather, it was to investigate what is happening on Earth. Humans have suddenly been disappearing, particularly in Karakura Town, but there weren’t any signs of any hollows. Shinigami patrollers are also disappearing from the said town. This has caught the attention of the Gotei 13, and to avoid any huge blow to the members of any division, has resorted to findtalented students in the academy to serve as the investigators. They saw the potential in Kenji, and offered him a mission in which that if he would succeed, he can leave the academy anytime and join the Gotei 13 at once. Kenji accepted the offer without thought. The day of the investigation finally came. Kenji was immediately sent with an average level shinigami to Karakura Town, in case the worst case scenario happens. Kenji in particular did not approve of it, but it was a requirement given by the Academy if Kenji was to accept. He had nochoice but to comply. They search everywhere in Karakura Town. Although there we're no signs of it, Kenji knew that a hollow was in here and that same hollow is the one causing the disapperances. Kenji asked Gotei 13 if they had anyway of contacting him, as he discovered something constant to the disappearances. One person always disappeared every hour. He wanted to use this to his advantage. He brought with him a device that will allow Gotei 13 to contact him once a person disappears. He patiently waited for news, and as an hour got so, he was informed of a human that has now suddenly disappeared, without a hollow trace. Asking more information, he asked for the coordinates of the said person. They told him that it was approximately 3km south of the center of Karakura. The word center flashed in his mind and he went to run to that particular center. 100 meters away from the center, there was a powerful barrier. It was a good thing that his shinigami partner knew how to bypass the barrier. At last, Kenji and his teammate entered, and there they saw a hollow hidden inside the barrier. It was no wonder that the hollowcould not be detected. The barrier was blocking any spiritually aware being to sense anything inside the dome. He concluded this by trying to contact with Gotei 13, with no reply. The hollow sensed their breach inside the barrier. This hollow was capable of sucking a random person's soul as long as they we're in a 3km circumference. It was obvious and clear to Kenji. He was hiding so he could freely eat and be noticed, but not found. The hollow immediately charged at the Kenji and his companion, with Kenji dodging the first attack. It was a fairly-large hollow, appearing as somewhat like a centaur. He was not competent to fight this level of hollow yet, it wasn't the same adjuchas class hollow, but it was still able to compete at it's level. and his companion's teamwork were not of use against the hollow. They we're both exhausted. The hollow tried to punch Kenji's gut, with him jumping away from the attack. The hollow suddenly fired a cero, without Kenji noticing. The hollow was fast in it's movements, it was again another strong hollow- though not as powerful as the adjuchas hollow he first encountered. The cero was aimed at Kenji, and it was travelling fast, though still slower than that of a Bala. Kenji closed his eyes; he knew it was the end. He then heard a large explosion, and was thrown off by the ensuing shockwave. He opened his eyes only to his horror that his friend has died, standing. He blocked the cero with his bare body to save Kenji, and died. Kenji couldn't take it anymore. He screamed at the top of his lungs, and swept tears. Kenji's eyes opened after screaming his guts out. He opened them but he still couldn't see anything. Everything was pitch black. He then saw a white dot, shimmering like a star. It then grew in number, and now any where he looked there would be these star-like objects. He tried to reach for them with his hand. He stood up and took a step. But with every step, the dots don’t seem to come nearer. He then heard a voice. Kenji did as he heard, and saw a humanoid figure, which looks like he was made from electricity, specifically lightning, to form his human shape. This thing had eyes of human, blue eyes. "I see you really don't have a grasp on what's happening here, Kenji." "I never understood many things to begin with, that's why Itry to do so. Who are you?" "I won't tell you my name just now. Although I will tell you what I am. I am your zanpakuto spirit." "I figured as much.I asked your name, not what you are." "Might I ask how did you know my true nature?" "I am not dumb. I know that I am right now supposed to be battling a hollow. If I suddenly find myself in an unknown place, it's either I’m dead or it's my inner world. That's what my teacher taught me." "I see. I guess you know why I brought you here?" "We shall. There is one simple goal you must attain for you me to allow you to use my powers. If you can find out one way, of touching my body, then I will tell you my name and grant you my powers." Kenji ran towards this entity right after he stated the goal. When his hand finally reached the hand of the being, he was electrocuted. His arm became paralyzed, and then the entity deformed itself and reformed away from Kenji. Kenji fired a sokatsui aimed at the being. His aim was off, but it was large enough to at least hit a part of the being.But to his surprise, it only went through the being. The sokatsui projectile went on and on, until it just disappeared into the void, without even exploding. "Touch me, not hurt me.Though I know what you are thinking. If you could hurt me then physically you might just be able to touch me. Such creative mind." "I wasn't trying to hurt you. I was just trying to know what you are really. I guess that shock I received may only mean that you are indeed made up of electricity. If you we're in a somehow physical form, the sokatsui should have exploded on contact with you." "Does this mean you have your way now, Kenji?" Kenji slowly approached the being, and then pointed at his eyes. "The sokatsui was large. I noticed that it also got through your eyes. That is what I tested. Since it only got through you, it could only mean one thing..."
The being watched as Kenji neared his fingers on his human eye. But, to his surprise, Kenji stopped halfway through. "What is it? It's your chance." "Chance? Are you kidding me. If I touch you again I would just die. There is no way for me to touch you. You knew that from the beginning. This was the challenge. To read beyond the lines of what you understand. You are the one who will be under my control. Now, what is your name?" The being let off a laugh. It was a very loud one, a mocking one indeed. "You are right, Kenji. There is no way to touch me. Atleast, not on that state of yours. But, since you have passed this test, allow me to tell you my name." Kenji just noticed that he was standing on open space, with no flooring. Just then, tiles of electricity formed below his two feet. Anywhere he stepped on, these tiles will keep on generating. "I am Nagare. Try holding me now, Kenji and I will grant you access to my powers." Kenji grabbed hold of Nagare's hand, the same being which electrocuted him when he first touched him now was somehow reachable. He then awoke, on his knees, with both of his hands generating electricity. Finally, the hollow charged at Kenji, and with a glimpse of an eye, a large electrical surge comes out of both of Kenji's arms, shocking the hollow who was only 10 inches away from him. The hollow dropped dead on the ground, as Kenji passed out. Kenji woke up on the 4th division headquarters. He was visited by an unknown shinigami messenger, who asked Kenji if he would now like to leave the academy. The messenger also told him that they found him lying on the ground with his zanpakuto on it's shikai state, and that the academy will guarantee his graduation on his sixth year instead of letting him skip. Kenji, wanting to see life more and more after every expierience, decided to accept. His last year in the academy was not too expressive. Kenji was just waiting for him to graduate. At last, that day came and he was assigned to the 11th Division. With the examiners not knowing his zanpakuto's power, they decided that he be placed in the melee-combat division. For the next years, he spent it mastering his shikai's abilities and his own, developing a better swordsmanship style, an improvement in hand-to-hand combat, and also, because of his zanpakuto's nature, he also trained in the arts of kidou. Kenji, the cold and serious guy- the one everyone despised, the smart man and the rude person did not change. Rather, he improved himself in his beliefs and is now shaped as the man he is. Kenji trained for years to master his shikai. By the age of 140, he had completely mastered the use of his shikai. For another 100 years, he lived in seclusion and in hiding to try and materialize his Zanpakuto into the material world. He one day succeeded in doing so, and had a small conversation with his zanpakuto. Kenji stabbed his katar on the ground. Nagare laughed the same loud laugh again. But this time, not because Kenji passed, it was because of how Kenji looked stupid. Kenji wasn’t trying to see if there was electricity on the ground. Of course there weren’t any, they’re not inside his inner world. Rather what Kenji did was use the ground as the conductor, and created a field of current on the ground. This will serve as the bridge to him and Nagare. Using the current he made below, he used the currentof different charge of Nagare. He knew that Nagare was always positively charged, and the flooring on his inner world was also positively charged. This is why Nagare floats above the flooring inside his inner world. This time, Nagare was on his two feet. The current stuck on to Nagare’s two feet. Kenji shunpoed near Nagare, and then slashed his blade across Nagare’s midsection. Nagare slowly dissipated, his laugh having not stopped yet. Nagare was slowly being absorbed in Kenji’s shikai, and it was the moment, he achieved his bankai. After achieving bankai, he took the captain proficiency test and passed after his display of his bankai. He was appointed as the new captain of the 6th division. Kenji became known for his exceptional skills in all aspects, and his strategic and hidden leadership skills. He was appointed as new Captain-Commander of Gotei 13 after the last one retired. Kenji quickly accepted the offer made to him. The RP Sample included in the Spoiler is from one of the threads in another Bleach RP site. This is how I usually RP. Note: Me being a captain-commander is non-existent in the sample, and there might be some names that might be unfamiliar. Kenji smiled for a bit, his eyes were really amused. This guy spurred about not letting these people get hurt. Kenji, and even Seiwa didn't plan for anyone else to get involved, other than those already directly involved on this matter. "No one ever said that we we're going to hurt these humans. We are on direct orders not to. Still, don't think just because you are trying to sympathize, you'd save yourself from not being able to move for a little while." His katar sparked wildly, as he continued to move it and as it got near Inoto's neck, he could feel the electricity somewhat stabbing his skin through little knives. The sensation itself felt as if a shiver down your spine, only much, much more lethal. Finally, Kenji stabbed his katar lightly on Inoto's neck, light enough that no major damage from the blade's sheer sharpness would be made, deep enough to ensure that a part of the spine is touched, and strong enough to actually penetrate through skin or flesh. His katar's electricity disappeared, and he slowly removed his katar from Inoto's neck. His zanpakuto returned to its sealed form, as he slowly sheathed his sword. He made sure to move the table a few meters away from Inoto, to ensure that he wouldn't land on it once he realizes he couldn't move. It wasn't Kenji's direct ability to actually paralyze anyone, but the way he used his electricity was solely for that purpose, a whole body paralysis. Once this electricity penetrates through skin, preferably anywhere he could touch with his katar, the electricity damages the nerves. In particular, if this was used on the limbs correctly, it could paralyze the brains communication to that particular part of the body, but where he placed his attack was far more superior. Placing it on the spine, the backbone of the nerve system that connects the bodily nerves to the brain. Once the nerves are damaged, his brain wouldn't be able to communicate throughout his body. All parts except his head would feel numb, and any kind of wounds he receives at that particular time are deemed painless. A side effect though, was his body could stutter every now and then from the sheer amount of electricity that directly entered his body. Inoto was pretty lucky if he is still able to talk after that. Kenji himself has trained his body and through practice was able to memorize the muscle movements that were needed for this kind of attack, as he had used them countless times. As he finally sheathed his sword, he slowly walked away from Inoto, seemingly still standing there. "That should be over. He completely ignored me. Not that I would complain about it anyway, if he did want to peacefully get done with this, he should have at least noted the enemy behind." Kenji then noticed the guard that was following their leader around. The atmosphere from here on moved from sunny and warm to a bit dark and lonely, but the day was a success. A speck of coldness rubbed Kenji's skin, it felt good to release his electricity once in a while. Though, if it wasn't for his limiter, these humans could have been sorely affected as well, not that he cared. 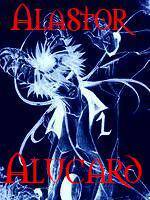 He looked at one of the guards Seiwa brought with him, and then raised his arm up a bit and pointed Inoto with his index finger. "He wouldn't be able to move for awhile. Go ahead and bring him back. I'll be going on my way." Kenji pulled the translucent door, and started walking away slowly with his hands on his pocket. As usual, his face didn't show the slightest bit of care as to that welfare of their target, anyways, if this man would die it would be none of his business. To that end, he left the omnitsukido to finish the job and actually take the motionless Inoto back to Soul Society. Kenji began to be absorbed into the bright, white light on his exit, his body seemingly disappearing without a trace. Spirit Manifestation: Unclear whether a man or woman, his zanpakuto spirit appears as an entity made up of only electricity; albeit appearing as blue to sky blue lightning shaped lines forming a human body, and is constantly glowing and silver glow. A notable feature about his appearance is its only distinguishable human cosmetic--its blue eyes. Other parts of its body, just like its toes and fingers are formed of a lightning-shaped lines. Inner World: His inner world is a pitch-black area with brights dots from miles away. Similar to outer space, only- it is much more of a void. These stars symbolizes Kenji's progress in gaining the truth he wants to learn. At first glance, it would seem that you we're standing on an invisible surface, but once you take a move, a tile made of lightning would appear on that particular place, and disappear once you step out. Sealed State: His sealed zanpakuto appears as a katana, approx. 65 cm. with a silver colored guard. It's handle is colored silver as well, and has a thin rope, attached to it, just under the guard. The length of the rope is about 10cm. The blade has black and white markings along it, randomly placed; shaped like large slashes, with one end larger and the other end as small as the tip of the blade. The sheathe somewhat has the same color of the metal, copper. Shikai Look: Kenji's shikai appears as two different equipments. A single, silver colored Katar on his right hand, and a silver colored metal glove on his left. The katar and glove is made both made up of silver--an element of high conductivity. The katar's blade is shaped like a large triangle, with the larger end stuck to it's handle connected to each other with two metal bars of a blue shade--also made up of silver and with another bar perpendicular to the other two, being the actual handle itself. This provides offense. The glove meanwhile, is a silvery-metal glove extending from his arms up to the middle of his fingers, except the thumb. He can use his thumb to reach for a thin silver wire that extends to 5m. This wire is also very strong and will not easily break. This glove provides the defense with the wire being additional offense. Shikai Ability: Nagare's ability is to create electricity, allowing him one electricity generation per post, which Kenji could release or allow to flow in different ways. The electricity is always generated on his Katar. The electricity is generated by gathering his reiryoku on his katar, and then converting that reiryoku into electricity. Once released, a discharge of reiatsu appearing as flash of electricity covers Kenji's right hand. Then-- A large discharge of electricity is released. It can damage any opponent on a close-range from Kenji, about 2 meters. Though the discharge cannot affect those who are aware of the oncoming electricity. This discharge is only for the initial release, and is not accessible again. After releasing his shikai, the actual electricity generation will not begin. Kenji must first use this ability. Only then will the generation of ability be continuous. This ability uses Kenji's reiatsu and accumulates them into his katar, and then after collection transforms these reiatsu into electricity. He can only usethis once every post right after use of the generated electricity. It drains his reiatsu and after about 18 posts will not allow him further usage. This ability only allows him to generate the electricity. Kenji could hold the charge as long as he doesn't use it. This is the only ability that allows Kenji to actually discharge, release or let the current flow to another object. Although there is no need to state the name to use it, Nagare told Kenji the name of the ability for it to become more precise. It allows Kenji to let the current flow from his shikai by touching the object with it. Enemies’ that touch the katar will let the current flow to the body; this also holds true with objects of conductivity except if they are not conductors. If an object receives the current, it is possible for the current to transfer to another object/enemy. The electricity is not visible. Also, it will only travel on contact. This ability will never affect a non-conductor. Also, as long as he has the electricity with him he will slow down by 1/4 his normal speed. This second ability is active so long that the electricity is continuously being generated. For every tier higher than Kenji, 2mA is subtracted to the 2mA or 20mA depending on the circumstances. The reason that the electricity is formed on the katar is so that once the enemy has an exposed wound, the current will be able to travel at its highest point. Also, the current will only travel if the object hit is a conductor, mainly metals and the human/shinigami body. This ability will only let the electricity flow if the object is actually touched. The real purpose of Kenji’s shikai ability is to put his analytical skills and strategies to good use. He uses these to make battle plans ortactics against his enemies, using his surroundings and his insights for practical use. This is where Kenji’s true strength lies. Cooldown/duration:Technique 2 is dependent on technique one, and the power used by tech 2 is actually from tech 1. For every post, it allows Kenji ONE electricity generation, and can only generate electricity for up to 32 posts. Kenji must wait for at least 15 posts until he can use his ability for another 13 posts. 16(wait) posts for 15(replenished), 17(wait) for 17(replenished) and 18(wait) for 18(replenished) and so on. Bankai Look: Once his bankai is released, his katar and glove will spark electricity for about 2 seconds. After which, a strike of lightning will shoot downwards and hit Kenji, creating an explosion. Every enemy around the area will be blinded for a short while, and when their sights return they will see that they are inside a dome, about a 500m in diameter. The dome is sky blue in color and electricity is visibly flowing around it. Kenji’s glove and katar will disappear, but it will be replaced by a sword similar to his sealed zanpakuto. BanKai Ability:Kenji’s bankai ability is to manifest all of his electrical current around the dome. The dome’s border contains the negatively charge electrical charges with the air and ground as positively charged. Kenji’s first step is he will use this ability, Hiraishin, to specify a target which would act as a rod. Anyone Kenji touches with his hand will become a rod. An enemy touched will have a lightning shaped seal on his right palm. Kenji’s purpose of this ability is to manifest lightning strikes from anywhere around the borders of the dome. For every post, Kenji will be able to use his mind to specify an area which the lightning will come from. This means that a post after using Tokkan for the first time will grant him one lightning strike. He could place it anywhere around the borders of the dome. If he specifies it to be somewhere above, the electrical current that is visibly forming the dome will accumulate in that area and then fire once all the current has been collected. This allows the enemy to anticipate where the lightning will come from. Only an enemy that is a rod will take damage. Kenji will also take damage if hit by his own lightning. The lightning is not powerful enough to kill in a hit, but it is strong enough to hurt and sometimes cripple an enemy. Again, Kenji’s real strength lies in his battle tactics, not in the actual force of the weapon he wields. Though, due to extensive training, Kenji has developed his lightning so that a direct hit from the bolt may be lethal. The dome shrinks as Kenji’s own lightning shaped seal appears on his forehead. The dome then engulfs Kenji, as visible electrical current manifest around his body. During this state, his body will glow a blue aura with electrical sparks appearing around him. Kenji’s final ability condenses the dome into his body. This grants him a slight increase in speed. Also, every slash he makes are embedded with electrical current, thus he has an unlimited amount of current, but can only travel from his sword to his enemy. He can only use this ability for about 12 posts, after which his bankai will transform back to shikai, and will not grant Kenji any electrical ability. He will also be exhausted after use. Cooldown/duration: The whole bankai technique, unless if Kenji uses Denkiyouryou, is available for about 30 posts. Effect: Summons six thin, wide beams of light that slam into a target's midsection, holding them in place. The target is then unable to move any part of their body including the parts that were not struck by the beams. Effect: A rod formed of energy is thrown towards the target before it disintegrates into numerous short rods which are used to pin the target to the surroundings and render them immobile. Effect: Creates an energy barrier in the form of a rectangular wall. According to Byakuya, it is capable of stopping destructive spells up to #89. This is seen also when Aizen uses it to block Tessai's Hadō #88. Basically, he uses Bakudou more than Hakudo, but he is known to be able to use both as proficient as the other, and in all levels of skill and number. Well, I did follow it, but I added bits of tiny info like the spiritual manifestation. As for my skills, your the first person not to understand, so I don't really know what to edit or say. Mind telling me what's confusing you?